Concerns of an economic downturn in South Korea sent stocks to a 17-month low as a key index in Seoul continued to slide. 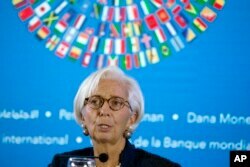 The decline came after the International Monetary Fund lowered the nation’s growth forecast. Experts tell VOA that unless the government changes course, current economic policies will likely lead to further losses. Stocks in South Korea fell Wednesday, reeling from fears of an economic downturn that crept through the markets. Seoul’s benchmark Korea Composite Stock Price Index (KOSPI) shed more than 1 percent of its value (closing down 25.22 points). It was the seventh straight day to do so. Some analysts said the steep decline Wednesday was the result of the International Monetary Fund’s lowering South Korea’s 2018 growth outlook to 2.6 percent. The IMF extended the downward trending outlook through 2023, keeping South Korea at a steady 2.6 percent growth, rather than the 2.9 percent it originally predicted next year and beyond. The IMF report shone a bleak light on the international market as well, cutting predictions by two-tenths-of-1-percent to 3.7 percent, citing the trade war between the United States and China as the main factor. Dankook University professor of economics Kim Tae-gi said Korea’s downward revision is because the two main trading partners that South Korea has are the U.S. and China. “[The trade war] will impact the export of goods to China as well as to the United States,” he said. He says trade wars and depreciated currency rates will negatively impact the Korean economy. But it is not only the trade dispute between the so-called G2, says Yonsei University economics professor Sung Tae-yoon, that has a negative impact on the South Korean economy. The next U.S. interest rate hike will “burden” the Korean economy, according to Sung. He adds that while Seoul does not have to follow suit with its own rate increase, it probably will, and that will impact real estate and housing policies. The South Korean economy probably is not going to get better any time soon, according to experts. “The economy is expected to be bad next year as well,” Kim tells VOA. Increased interest rates, coupled with decreasing business investment, will likely make for a slower domestic economy, he said. It is that decreased investment, Sung says, that will hurt the economy. He said the government created policies that raised business operational expenses, and as a result, company profitability dropped. While there were some winners, such as the semiconductor sector, many lost out, he said. Another potential winner could be South Korean exporters, but declining employment may further contribute to dim economic prospects, Kim added. 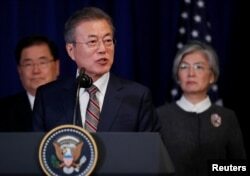 If the economic situation remains the same and unless the administration of President Moon Jae-in changes its policies, economic profitability will continue to decline, he cautioned. To get out of the negative trend, Kim said South Korea must stop businesses from relocating to China and create a business environment necessary to boost, not only domestic profitability, but one that entices new businesses to start. Through the inter-Korean summits, South Korea’s president has touted the potential economic gains to be had as North Korea denuclearizes when construction, housing, and other projects commence. Kim said that would be a move in the positive direction, as the projects have the potential to boost domestic and international investment. But Sung pointed out those projects are dependent on peace and trust between the two Koreas, and without the easing of international sanctions, nothing can move forward. The uncertain economic future facing South Korea continued to affect the stock market Thursday as the KOSPI continued its decline, down more than 10 percent this year.